In mid-spring the mulberry’s riches lie spoiling on the ground. Are you lucky enough to have a mulberry tree growing nearby? 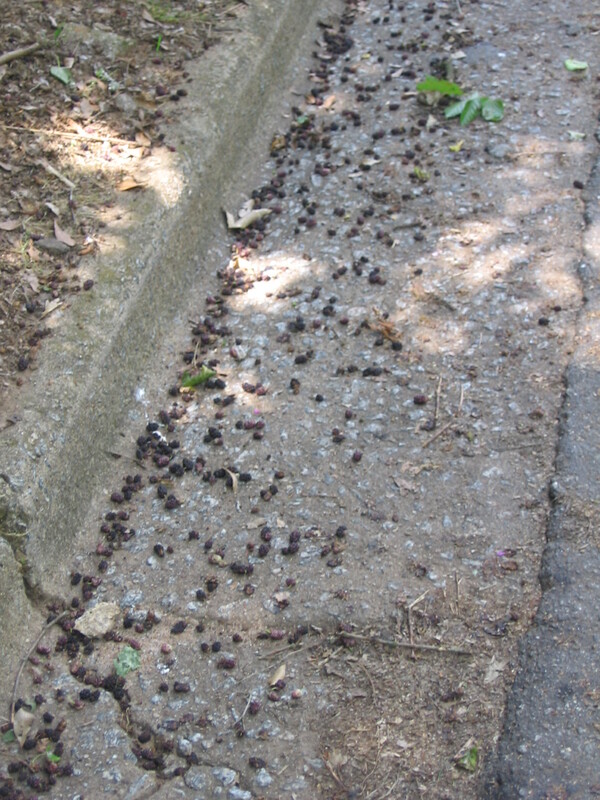 Chances are you’re familiar with the staining mess of blackish-purple berries accumulating underneath the tree. Harvesting these nutrient-rich berries could bring you health and wealth. 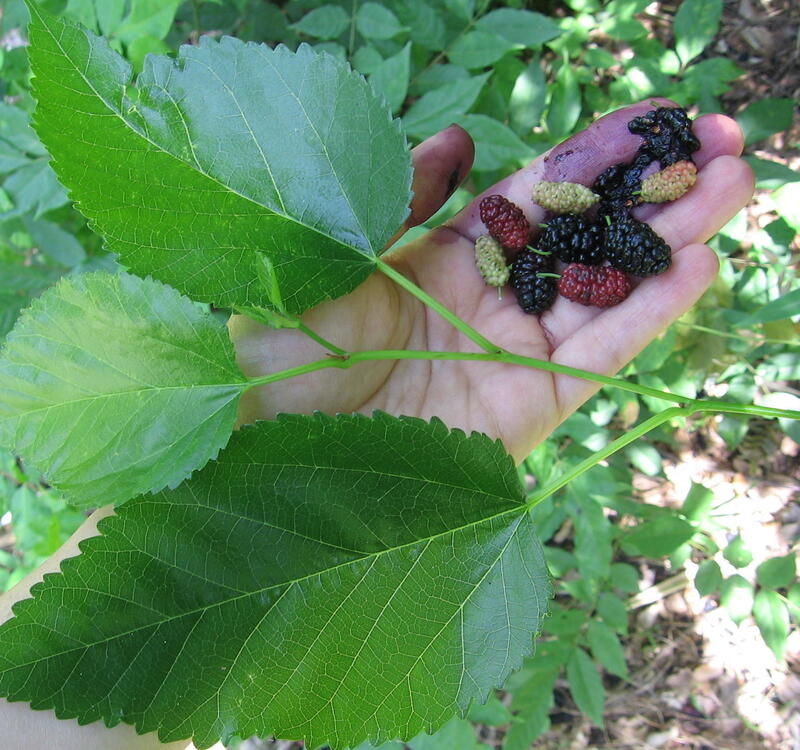 In the Southeast we have two common species of mulberry trees: the native red mulberry (Morus rubra), and the non-native white mulberry (Morus alba). Both species have distinctive leaves which can be unlobed, unilobed like a mitten, or trilobed. There aren’t any known poisonous look-alikes. A distinguishing characteristic of red mulberry leaves is that they feel like sandpaper on top, and are downy on the underside. The non-native white mulberry, which is considered invasive, has smooth, glossier leaves. As the host tree for the silk worm, the white mulberry was imported from China in the 1800s in an attempt to start a silk industry in the New World. Obviously the silk industry didn’t take in the States, but the trees have naturalized. We know that if silk had been produced in the US, in time it would have been relocated back to China, anyway. Most red mulberry trees have fruits that start out white, turn red, and ripen black. The white mulberry trees, however, have fruits that stay white when ripe. Red and white mulberries have hybridized to create pink fruits. All of the ripe fruits are edible, but don’t eat the unripe ones, they can give a stomachache. Though mulberries resemble a thin blackberry, the fruit is slightly less sweet and tart than blackberries. Mulberries are still pretty tasty. The rich, dark pigment of the ripened fruit indicates that they are packed with powerful antioxidants, such as anthocyanins, polyphenols, flavonoids, including resveratrol, a popular anti-aging compound found in red wine. Recent studies show that mulberry fruits have a protective effect on the oxidative stress of dopamine neurons, leading researchers to consider mulberry as a prevention or even treatment for Parkinson’s disease. Mulberry fruits also protect eyesight and capillaries, which can prevent some of the consequences of diabetes. Traditionally, many countries have made tea from the dried leaves to lower high blood sugar. Current research has shown the leaf tea of the white mulberry to have a hypoglycemic effect after a meal. In other words, the mulberry leaf lowers the blood glucose levels, and is speculated to work in a similar method as Metformin, a diabetes pharmaceutical. To harvest the little antioxidant powerhouses, gather them up by taking a sheet that you don’t mind staining (mulberry is a beautiful dye), and spread it on the ground below the fruit-laden branches. Shake the tree branches you can reach, or use a ladder very carefully to shake the upper branches. Very gently soak the berries in cold water for an hour. Eat them in pies, cobblers, muffins and jams, as a topping on cereal or yogurt, or just pop them into your mouth as they are. Mulberries are very delicate, which is why we don’t see them in grocery stores. They don’t keep in the refrigerator, either, so whatever berries you don’t eat or cook immediately, dry or freeze the rest. Mulberries could be your found treasure for health and wealth. Online sources of dried berries bring in a bundle. Always keep in mind that to the untrained eye, and even to the trained eye, plants can be difficult to tell apart. Some plants are toxic at low doses. Do not eat or use a plant medicinally for any purposes unless you are sure of the identity. Be aware of possible urban pollutants or herbicides. Forage at your own risk. Neat! Why do mulberries need to soak in water for an hour before eating? Since mulberries are usually very delicate, rinsing and shaking them around in a colander can damage the skins. By soaking them, you clean them without releasing their juices. If you don’t care about their appearance, then you can rinse and shake. Or, if you’re like me, you’ll just eat it right off the tree. Thanks for your question! Because it takes that long for all (most) of the little bugs to crawl out! There is no telling how many bugs I’ve eaten.